Following the cooperation with a distribution partner that started in 1996, from January 1, 2019, Anton Paar Spain exclusively distributes and services all Anton Paar products on the local market. Demonstration labs are available in Madrid and Barcelona, allowing for extended customer training and application support. Joint Letter – Anton Paar GmbH/Massó Analítica S.A.
Mr. Luis López-Villalta is the managing director of our subsidiary Anton Paar Spain S.L.U. Are you looking for a solution? Do you have any questions? Take advantage of Anton Paar moving closer to you. Enter your instrument details and we will assign you to a direct contact person. In addition, you can participate in quarterly sweepstakes to win prizes such as a new tablet, seminar vouchers, and free application support. 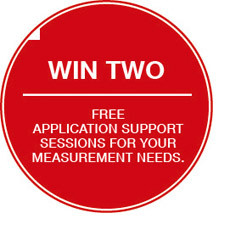 Make sure to sign up here for a chance to win two free application support sessions at our second draw. Winners will be drawn on June 30, 2019. "Click to send information” öğesini seçerek, Anton Paar’ın kişisel verilerinizi, sözleşmeye bağlı yükümlülüklerin yerine getirilmesi için kullanılabileceğini kabul etmektesiniz. Gizlilik Politikası belgesinde daha fazla bilgi bulabilirsiniz. 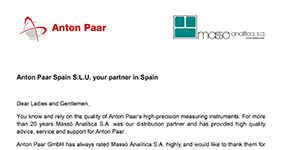 Anton Paar Spain took over operations from our former distribution partner Massó Analítica S.A. and coordinates sales and service activities for all our product lines now. Joint Letter - Anton Paar GmbH/Massó Analítica S.A.